KISS have announced the first two dates of a fall tour of Japan. 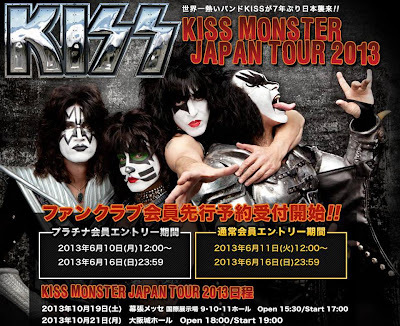 In support of their latest album, “Monster,” the band will play Tokyo on October 19 and Osaka on October 21; complete details will be available soon. KISS are currently playing a mixture of headline shows and festival dates across Europe this month before launching an extensive Canadian tour in early July. The New York rockers are marking their 40th anniversary this year; frontmman Paul Stanley explained the band’s longevity in a recent interview with Sweden TV4’s "Nyhetsmorgon."